About seven years ago, I read a magazine article about a couple in Pennsylvania who host a weekly soup night for their friends and neighbors fall through spring. They provide the soup -- the friends and neighbors provide breads, salads, desserts and beverage of choice. Intrigued by the concept, I copied off the story and fired it over to a good friend. Do you think this a weird idea? Hell no -- when do we start? was her response. I made up a flyer, attached the article and dropped it in the mailboxes of some 15 or so good friends. And waited for the first night. The house buffed and polished. 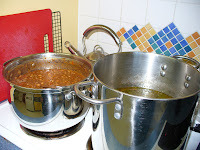 Soup and chili, warm on the stove. Would anyone show? Show they did -- and continue to do so. Tonight, year 7 of Soup Night begins at our house. Some things have changed. For example, our hoard of high school-age boys are gone, some graduated from college, some just finishing up, but now scattered across the state and beyond. I miss the way they'd lumber in and sidle up to the soup pots (after saying hello, of course) to check out the night's offerings. They'd arrive in groups of 2 or 3, sometimes with unexpected friends in tow -- always welcome and always grateful for free food. And lots of it. Once their plates were loaded, the boys disappeared downstairs to watch sports -- until it was time for seconds. And thirds. Or to check out the newest arrival of bread, salad and dessert. 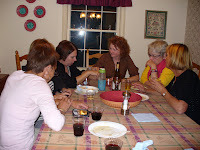 We've added new Soup Night friends and said good-bye to others. We rotate through homes now instead of using ours exclusively. And we are little more sedate than the early years, when a Soup Night head count could approach 40+. Other things never change. Friendships begun on gymnasium bleachers and soccer sidelines have been forged and strengthened over bowls of soup and chili . We've gotten kids through high school and college, shared their triumphs and struggles, and laughed together at their "extracurricular" antics (which thankfully we all survived -- and still do). There are new daughter- and son-in-laws -- and grandchildren. We've worked through lost jobs, illness and death. We've celebrated and cursed the Zags, Cougars and Huskies. We've offended each other with our politics, forgiving and forgetting over the following week's serving of chicken noodle soup. We've attended Mandatory Meetings, school musicals, movies and gone on road trips together -- often first proposed or conceived over a bowl of soup at Soup Night. Soup Night friends have become Soup Night family. And these special dinners are starting once again.